The 3rd place to have a beer in the village and the 2nd proper pub as you head out towards Kendall. Eclectic mix of bits and bobs dotted around the pub including a wall of mirrors on the right as you enter. A friendly and attentive barman welcomed us as we enter and then answer's my questions regarding the signed football shirts that hang in the back area towards the toilets. Large open fireplace in the front bar. Lots of space for diners dotted around, various glass cabinets selling silver, glass and china add to the charm. Food served from 6pm in the evening and from this time the place was filling up nicely. Opposite the pub is a large beer garden with a stream running through it. Very handy for the bus to Lancaster and Keswick as the stops are outside the pub. A great pub, well worth its acclaim in many beer and pub guides! 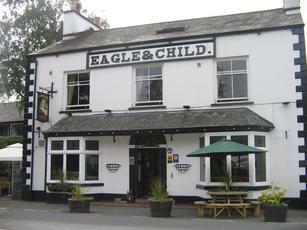 Well kept cask ales at reasonable prices and decent food on the lunch �5 menu. Well worth a special visit. Very enjoyable pub I've wanted to visit for years. Beer (quality and sensible range) was very good, even if Hawkshead Bitter not as great as I remember from 2003. Food not exceptional either, but at �5 not surprising and filling. Pub itself is fantastic. Lots of tourists (like me !). Great pub, great character. Food was good if not exceptional. Character pub at the end of this pleasant village and near the river. It has a quirky layout, with the one long room hugging the bar but with various subsections, including a curious conservatory-type area.Pots and pans adorn the walls, alongside some rather fruity mock Victorian medicinal advertisements. The food here is well regarded but I didn't try any. A roaring fire added to the atmosphere. The beer selection was very strong, featuring beers from many fine Lakeland Brewers- 2 Hawkshead beers plus Loweswater Gold, Coniston Bluebird and a couple of others. Had the Loweswater and the Coniston, both fine pints. Really enjoyed it here, alongside the Hawkshead brewery hall- the antithesis in terms of atmosphere but both with their charms. Would certainly return.